As a cultured citizen of the internet, you know that The Shining is Stephen King novel in which a lot spooky and horrifying things happen in a hotel. 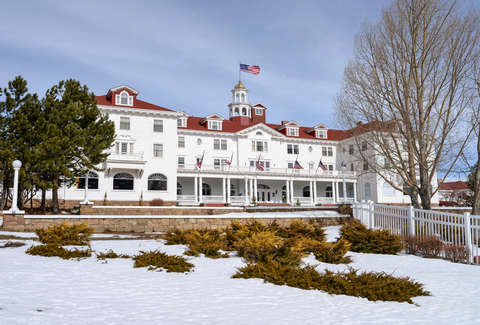 Well, that book was inspired by a real place you can stay in Colorado called the Stanley Hotel. While reports of ghost sightings there aren't uncommon, we imagine those visitations aren't nearly as unsettling as the black bear who made itself at home in the lobby on Thursday. The video above was shot by the front desk supervisor, who was the only one around in the early hours of Thursday morning when the bear somehow managed to wander into the lobby, sniff the couch, stand on a table, and then leave. There were 300 hotel guests that night, KDVR reports. The scene wouldn't look out of place in a movie adaptation of the novel. "Late night visitor from the wildside visits our hotel lobby," reads the Facebook caption the hotel posted along with the video. "We'll make an exception to the rule about jumping on the furniture." You have to commend them for being so upfront about wild bears hanging out in their lobby. The clientele is pretty brave to stay there at all though, so we're sure they won't mind.